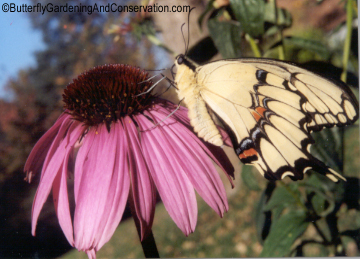 Giant Swallowtails are the largest butterfly in much of the US. Their wingspan ranges from 3.5 to 5.5 inches across! They tend to stay in woodland areas or, in the southern US, in citrus groves. The adults sip flower nectar for food. - all citrus family plants. Their eggs can be yellowish, orangish or green and are laid singly on host plant leaves and twigs. The diameter of their eggs is a little over 1 mm. The caterpillars look a lot like bird droppings and can get as big as 4.5 cm long! Caterpillars of many butterfly species tend to change their appearance as they develop. 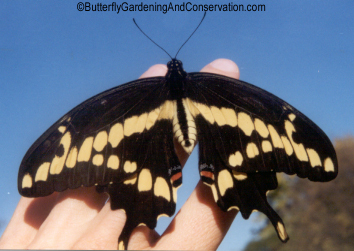 Giant Swallowtail caterpillars however do not change their appearance very much. Some species tend to look a bit like bird droppings when they are smaller but later turn bright green, or get stripes, etc. 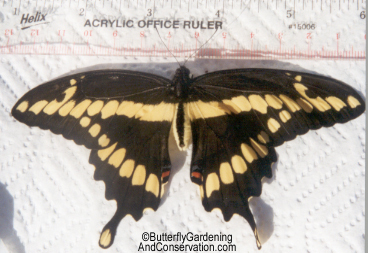 Giant Swallowtails retain the bird dropping appearance until they pupate. 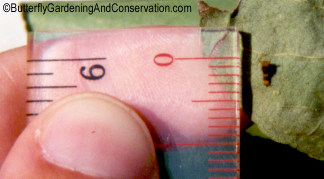 First instar caterpillars are around 2.5 to 3 mm long right after hatching, but grow quickly. This picture was taken right after this one hatched. Unfortunately, there is a shadow to the right of its body, which makes it a little hard to see. Notice the pattern of light-dark-light-dark-light coloration. 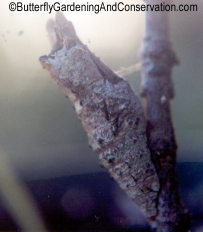 This is also a first instar caterpillar, the picture was taken just 2 days after it hatched. Notice the light color around its head area is now darker, giving it a pattern of dark-light-dark-light. Second instars look pretty much the same, only bigger. 2nd instar right after molting, old skin can be seen laying behind it. The dark, round thing laying to its right is its old head capsule, which always falls off separately from its skin when molting. This is a view from the side. Its head is still light colored after having molted. Third instar right after molting. Fourth instar right after molting. 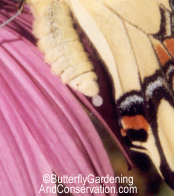 As mentioned earlier, the appearance of Giant Swallowtail caterpillars doesn't change too much as they develop! Late 4th or early 5th instar sticking out its osmetrium. Swallowtail caterpillars have an orange/red fleshy forked organ called an osmetrium that they stick out when distubed to scare off predators. Osmetria give off a bad smell when stuck out - from two chemicals released from it. 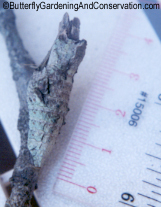 Fifth instar caterpillars do change their appearance a little from that of the earlier instars. Nearly full grown fifth instar Giant Swallowtail caterpillar. 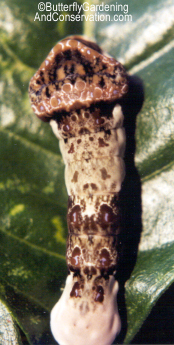 Fifth instar Giant Swallowtail caterpillar from the front. 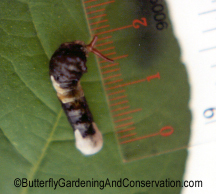 Fifth instar Giant Swallowtail caterpillar from the side. Fifth instar close-up showing more detail. As mentioned earlier, fifth instars do change their appearance from the earlier stages. The picture to the right is a close up that shows more detail. While they aren't the prettiest of caterpillars, the color pattern is complex and pretty in its own sort of way. 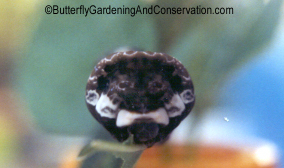 The chrysalis of Giant Swallowtails also have an interesting appearance. Unfortunately my pictures didn't turn out too good, problems with the lighting it looks like. Their shape is similar to other swallowtails and its overall appearance still looks like bark on a tree. 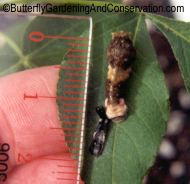 Giant Swallowtail pupa also have a greenish coloring to them that looks kind of like mold or moss growing on a tree. The beauty of the adults more than make up for any shortcomings in the appearance of the caterpillars. 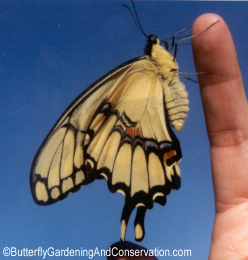 Giant Swallowtail from the side. View from the side again, this time resting on a Purple Cone Flower. This picture is a zoomed in part of the picture on the right. The drop of liquid hanging from its body is called meconium, which is a waste material butterflies release from their bodies after coming out of their chrysalis, it can also be brown, red or green in color.